Julie's Boyz: Do ya feel lucky? 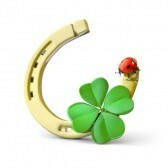 When I was younger, my mom used to always call me her "good luck charm". I did seem to win an inordinate amount of random drawings. On our honeymoon, DH and I went to Bahamas which is a big gambling place. We both came very quickly to the twin conclusions that we were not particularly lucky and we really hated losing our hard earned money in a game of chance. When our first baby was born, people were still throwing around numbers like 1 in 10,000 for autism so our knowledge of autism was next to nil. Of course to add insult to injury, Rain Man had only come out a few years earlier so what knowledge we had was skewed as well. Of course by the time Joe was diagnosed they were using numbers like 1 in 5000 but still I had several people assure me that it didn't run in families. If I knew then what I know now, I would probably have stopped there and I also think I would have been a better mother. I was reading Stuart Duncan yesterday and while I normally love his blog, yesterday's post just grated on me. In Don't fear autism and certainly do not fear your own child he says basically that parents are not having children because they fear autism. He says we should instead reassure prospective parents. Reassure them that they most babies are born healthy? I think they know this. I think if anyone is not having a child because they are afraid their child would have autism, they are simply not the gambling type. In the case of subsequent children once one is diagnosed, personally I think this a good thing. When you are at a high risk for something you should be allowed to consider whether that risk is personally worth it. When this generation of autistic children reaches adulthood, they will put a hell of an additional strain on the economy since most of them will not be functioning members of society. If the 1 in 50 number is truly accurate, then at least 1 child in 50 will also need to have a career that focuses on the care of autistic adults. That just boggles the mind. Yes it is very possible (98% possible) that you will have a neurotypical child. But a 2% risk to forever alter your life requires very careful consideration. Could you be a good parent to a special needs child? Maybe these prospective parents know they are too selfish to give up their whole lifestyle forever if their child is severe. Maybe mom and dad are both very into their careers and know that they could not make all the meetings that would be required. Maybe they are struggling financially and have heard how costly it is to have a child with special needs. Maybe their marriage is already rocky and the idea of raising a special needs child single-handed is daunting. That is a choice. Maybe they are just not gamblers. Julie, you said it perfectly. It doesn't mean you love your Joe less or that you may not have gotten pregnant had you known. You, like me, would just like to have been a tad more prepared. Life is hard. Life as a parent of a special needs child is a lot harder. I love that you said 1 in 50 children will have to learn how to be a caregiver. That is actually the scarier statistic!!! Julie, found your blog through Love That Max and am now a follower. I also have two on the opposite sides of the spectrum, we need to share some stories girl! Anyway, I hear you, I feel you on this post, I am with you. Having two on the spectrum has changed my life, I would say, for the good, but yes, it's super tough and not everyone is built for it and more has to be done to care for the special needs mom and not only the child. Great post, thanks for sharing!